When we bought “Windyridge”, we knew it was the location we had always wanted to live in. Kenilworth. We also knew that we would have to do some work to achieve the right living environment. And so, after three years of wrestling with ideas and understanding planning issues, we called in Peter Dutka. 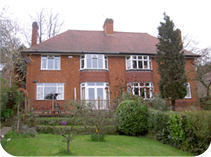 We had built extensions and conservatories on previous houses but we wanted far more than that. Peter sat down with us and talked in depth about how we lived, our work-leisure patterns. We wanted to be able to exploit the fantastic hilltop location and wake up every day to great views whilst also creating enough accommodation that our friends could still come and stay even with their growing families. 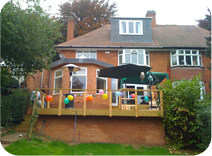 We love being outdoors whilst eating and socialising so we wanted to create additional living space that we would spend a lot of time in. Mike is a trained sports masseur and he needed dedicated space to work in which could be separated from our normal living space but that would still be inside the main house. One of the limitations of the house when we bought it was that there is only on-road parking which is almost 150 yards from the house, so we wanted to be creative and see if we could use the rear lane access and limited courtyard to get better vehicular access. Peter came back with all the answers to the complicated brief. Our loft space bedroom has an ensuite which our builder described as one of the best spaces he has worked on. The bifolding picture window gives unrivalled views across Warwickshire. My favorite reading spot is curled up on the sofa under this window. The positioning of Mike’s treatment room in the rear of the house means that we have made good use of the cooler north facing space. The most impressive element though is the large kitchen/orangery with bifolding doors onto the 2 tier garden decking. It’s like having a second house! I love the feel of the orangery with its garden views and light airy lantern and I have never spent so much time in the kitchen. This design project has completely changed the way we live in our house; we now have a dream house in a dream location. We are so pleased we called in Peter we would have no hesitation in recommending him to any client.